The 2009 AHA Accommodation Hotel Management Awards presented by ME Bank, was held at Burswood on Monday 24th August 2009. 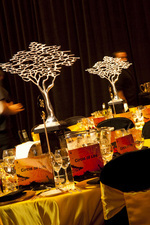 Burswood’s Grand Ballroom was transformed into an African savannah. The best of the best were recognised for outstanding service in a range of categories from housekeeping to human resources. AHA(WA) CEO Bradley Woods, said the awards night was the most important event for Perth’s hospitality industry, which rates amongst the best in the world, and one of the best evenings on Perth’s social calendar. 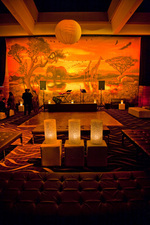 The Grand Ballroom was set alight with the inspirational colours and sounds of the African Savannah. Tables and chairs were draped in the dramatic hues of red, orange and gold symbolising the sun rising and setting over the desert. The night’s entertainment was kicked off in spectacular style with a powerful performance of the Lion Kings “Circle of Life”. The 40 strong ensemble of singers, dancers, drummers and even an aerial silk artist continued with spellbinding performances throughout the evening. 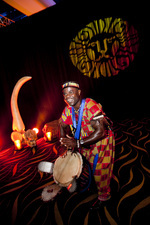 The entertainment including a mix of songs from ‘The Lion King’ and ‘Tarzan’ musicals. The five course African inspired menu featured smoked ostrich fillet with green paw paw salad and crocodile medallion with preserved lemon and rum & raisin dressing, this was followed by a unique apricot tea and thyme granite to cleanse the palate. The main course was either a vanilla and citrus cured red beef or roasted spatchcock served with purple congo potatoes, broad beans, artichoke puree and shellfish tortellini. An array of premium beverages was also on offer, including beer, white wine, sparkling red wine and spirits. Click here to view photos of the evening!